Not many 13-year-old girls are accomplished BMX athletes and cultured world travelers. But, Box Elder’s Caitlin (CJ) Parks isn’t your normal girl. Like many military kids, CJ has moved around the world. She was born in New Jersey, lived in the small German town Spangdahlem for six years, then headed to Rapid City where she has lived for the past four years. Her dad, Timothy Parks, is in the 28th Civil Engineer squadron in the Air Force; her mom, Tina Parks, works at the Childhood Development Center at Ellsworth Air Force Base. Moving around has affected her friendships, as she modestly describes herself as “awkward”; but BMX has allowed CJ to maintain connections worldwide. “I am a shy kid, so I don’t get out there much to talk to people,” said CJ about her school friendships, but she has been able to get out of her shell through BMX. The sport has made her more confident and is a shared interest with her racing friends. “I have made quite a few friends from races: a lot in Rapid City and Aberdeen, a couple in Wyoming, and in Nebraska, too.” She is close with the other racers at Box Elder BMX Raceway, as well, and her team – Elite Racing Products. At nine years old, CJ became interested in BMX after driving past the raceway with her parents. After some convincing, they watched some races and eventually her parents let her give it a shot. Today, her love of the sport is still alive. “I enjoy it so much that I beg my parents to go every night. I like the thrill you get from racing,” said CJ; and her dedication is clear to anyone who meets her. Initially, CJ’s mom tried to steer her to a safer sport, but fully supported her daughter when she realized how passionate she was about riding. BMX is, like many sports, heavily male dominated. It can be intimidating to be getting ready to go at the starting line and see only men. 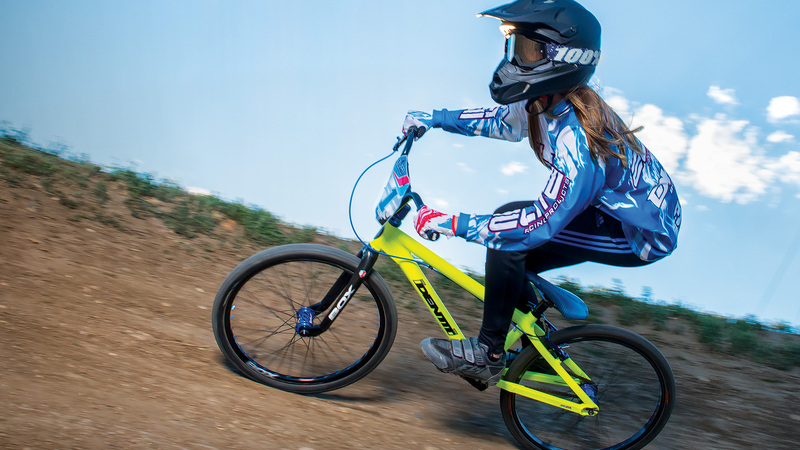 CJ hopes other girls will want to try BMX, especially for what it has given her — the confidence, athleticism, travel, and – most of all – it is fun! In August, she will be starting high school at Douglas High School, and despite having just graduated middle school, she has already held the State Championship and is currently leading her district. Her accomplishments have not been without hard work and dedication, though. She practices three nights a week, with each practice going for several hours, and races every other night except Saturday. CJ doesn’t let her lofty practice regime affect her grades, but she does have to prioritize her time. She chooses to go to practice rather than the movies on a Friday night like other kids her age. Recently, CJ has changed her competition age group – now riding against older racers of any gender. But, for fiercely-competitive CJ, she welcomes the new challenge and hopes the increased competition level will help make her a better biker.